Boaters find it comforting to know they’re never far away from one of the excellent marinas on Lake Allatoona. You can fuel up your boat with gas, fuel up the kids on snacks, or take shelter from storms, before heading back onto the lake. Park Marina — inside Red Top Mountain State Park — is open every day to serve boaters on Lake Allatoona. They can accommodate boats of any size. Park Marina never settles for what was best last year or the year before. For more than 30-years, they have continually upgraded, updated and improved all they have to offer your family and your watercraft. Park Marina is home to Paradise Boat Rentals, where you can rent boats in just about any size, color or flavor: pontoon boats, runabouts and personal watercraft. 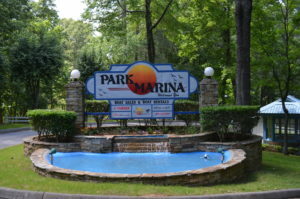 Park Marina is the Lake Allatoona’s largest marine repair service for anything from drive replacement to seasonal maintenance. For other marinas on Lake Allatoona, click here.